* A nitrogen-containing portion known as a nitrogen base. in the five different nucleotides. Figure 5 Subdivisions of a chromosome. A gene is a distinct region of a chromosome. The entire chromosome is made of DNA. Nucleotides are the building blocks of DNA. DNA: Most of the DNA in the cell is organized into chromosomes within the nucleus (a small amount of DNA is in the mitochondria located in the cytoplasm). Looking at Figure 6, which shows a section of a chromosome, you can see that the DNA exists as a double strand. Visualizing the complete molecule as a ladder, the sugar and phosphate units of the nucleotides make up the “side rails” of the ladder, and the nitrogen bases project from the side rails to make up the “steps” of the ladder. The two DNA strands are paired very specifically according to the identity of the nitrogen bases in the nucleotides. 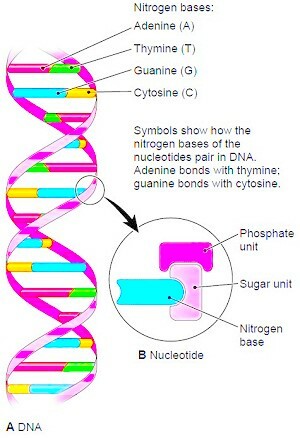 The adenine (A) nucleotide always pairs with the thymine (T) nucleotide; the guanine (G) nucleotide always pairs with the cytosine (C) nucleotide. The two strands of DNA are held together by weak bonds (hydrogen binds). The doubled strands then coil into a spiral, giving DNA the descriptive name double helix. The message of the DNA that makes up the individual genes is actually contained in the varying pattern of the four nucleotides along the strand. The nucleotides are like four letters in an alphabet that can be combined in different ways to make a variety of words. The words represent the amino acids used to make proteins, and a long string of words makes up a gene. Each gene thus codes for the building of amino acids into a specific cellular protein. Remember that all enzymes are proteins, and enzymes are essential for all cellular reactions. DNA is thus the master blueprint for the cell. In light of observations on cellular diversity, you may wonder how different cells in the body can vary in appearance and function if they all have the same amount and same kind of DNA. The answer to this question is that only portions of the DNA in a given cell are active at any one time. In some cells, regions of the DNA can be switched on and off, under the influence of hormones, for example. However, as cells differentiate during development and become more specialized, regions of the DNA are permanently shut down, leading to the variations in the different cell types. Scientists now realize that the control of DNA action throughout the life of the cell is a very complex matter involving not only the DNA itself but proteins as well. Figure 6 Structure of DNA. (A) This schematic representation of a chromosome segment shows the paired nucleic acid strands twisted into a double helix. (B) Each structural unit, or nucleotide, consists of a phosphate unit and a sugar unit attached to a nitrogen base. The sugar unit in DNA is deoxyribose. There are four different nucleotides in DNA. Their arrangement “spells out” the genetic instructions that control all activities of the cell. RNA is much like DNA except that it exists as a single strand of nucleotides and has the nucleotide uracil (U) instead of thymine (T). Thus, when RNA pairs up with another molecule of nucleic acid to manufacture proteins, as explained below, adenine (A) bonds with uracil (U) in the RNA instead of thymine (T). A detailed account of protein synthesis is beyond the scope of this page, but a highly simplified description and illustrations of the process are presented. 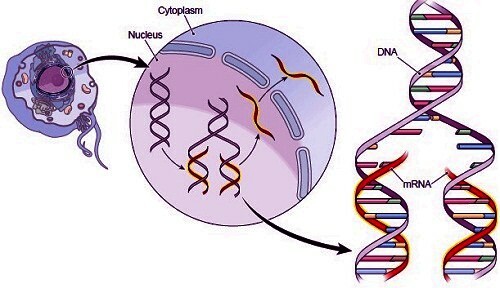 The process begins with the transfer of information from DNA to RNA in the nucleus, a process known as transcription (Fig. 7). Before transcription begins, the DNA breaks its weak bonds and uncoils into single strands. Then a matching strand of RNA forms along one of the DNA strands by the process of nucleotide pairing. (For example, if the DNA strand reads CGAT, the corresponding mRNA will read GCUA. Recall that RNA uses the nucleotide U instead of A.) When complete, this messenger RNA (mRNA) leaves the nucleus and travels to a ribosome in the cytoplasm (Fig. 8). Recall that ribosomes are the site of protein synthesis in the cell. Ribosomes are composed of a type of RNA called ribosomal RNA (rRNA) and also protein. At the ribosomes, the genetic message now contained within mRNA is decoded to build amino acids into the long chains that form proteins, a process termed translation. This final step requires a third type of RNA, transfer RNA (tRNA), small molecules present in the cytoplasm. Each transfer RNA carries a specific amino acid that can be added to a protein chain. A nucleotide code on each tRNA determines whether or not its amino acid will be added. After the amino acid chain is formed, it must be coiled and folded into the proper shape for that protein. Table 4 summarizes information on the different types of RNA. Figure 7 Transcription. In the first step of protein synthesis the DNA code is transcribed into messenger RNA (mRNA) by nucleotide base pairing. An enlarged view of the nucleic acids during transcription shows how mRNA forms according to the nucleotide pattern of the DNA. Note that adenine (A, red) in DNA bonds with uracil (U, brown) in RNA. Figure 8 Translation. In protein synthesis, messenger RNA (mRNA) travels to the ribosomes in the cytoplasm. 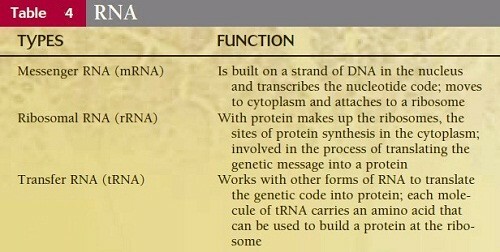 The information in the mRNA codes for the building of proteins from amino acids. Transfer RNA (tRNA) molecules bring amino acids to the ribosomes to build each protein.